We guarantee our custom framing services. 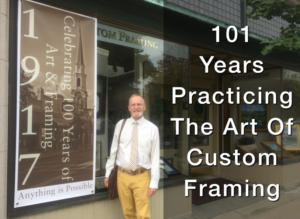 If you are not satisfied with your custom framing, we will replace the matting or framing, with materials in the same price range, at no additional cost, within 60 days of the sale. While we strive to design and manufacture the best quality product, we are well aware that errors may occur. Our salespeople are willing and able to resolve any service or quality issues, and in doing so will ensure you are pleased with our custom framing services.